Breast cancer is the most common site specific cancer in women and is the leading cause of death from cancer for women aged 20-59 years.1 The current NCCN recommendations for treatment of operable advanced loco-regional breast cancer are neoadjuvant chemotherapy with an anthracycline or taxane containing regimen or both, followed by mastectomy or lumpectomy with axillary lymph node dissection, and, if necessary, followed by adjuvant therapy.2 The decision for adjuvant therapy is strongly influenced by tumour biomarkers including (ER), (PR) and HER2 that are performed on core needle biopsy specimens using Immunohistochemical (IHC) staining and/or Fluorescence in situ hybridization (FISH) for HER2 testing. After NACT and surgery, biomarker studies are repeated on resected specimens and may be different from previous biomarker studies performed on core needle v biopsy.3 This may be due to chemotherapy effect or intra-tumoral heterogeneity and these changes may alter treatment decisions following surgery. After NACT the pathological response to treatment is assessed. Patients whose tumours had pathological complete response with NACT have statistically improved survival outcomes compared to those patients whose tumours demonstrated only a partial response, remained stable or progressed on treatment.4 In this study we aimed to assess the effect of NACT on LABC with respect to the tumour biomarker profile and histopathological response grade. Pathological response was assessed by the Miller Payne grading system in the 2 previously mentioned specimens for all patients.5 All specimens were concurrently reviewed by two pathologists. Data were entered in Micro Soft (MS) excel spread sheet. Quantitative and the qualitative data were described by estimating mean, standard deviation (SD) and proportion, respectively. Data display was done using tables and charts. McNemar Chi-square (χ2) test was used to draw the inference about outcome variables. A p-value < 0.05 with 95% confidence interval (CI) at 5% precision was considered significant. MS excel and statistical software SPSS 22.2.0 version were utilised for the purpose of data analysis. The average age of the patients was 45.62 ± 7.12 (mean ± SD) years, range 36-60 years. The majority of the patients (56%) were postmenopausal. The predominant histological subtype was infiltrating ductal carcinoma (96%) others being medullary (2%) and mucinous carcinomas (2%). ER positivity dropped from 80 to 78% following NACT. There was a corresponding increase of ER negativity from 20 to 22. (p = 0.671). 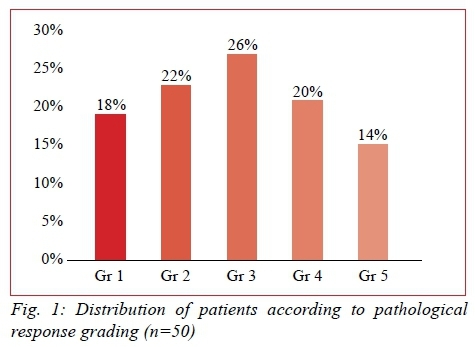 Sixty-six (66%) patients were initially PR positive and thirty-four (34%) patients were PR negative. After NACT, PR negative cases increased to 38. This change was statistically significant (p = 0.002). Sixty-six (66%) patients were initially PR positive and thirty-four (34%) patients were PR negative. After NACT, PR negative cases increased to 38. This change was statistically significant (p = 0.002). HER2 receptor positivity was increased after chemotherapy from 22-28%. The change of HER2 receptor expression was also statistically significant (p = 0.000) (Table 1). The Miller-Payne Grading System (Table 2) was applied for the assessment of post-NACT pathological response. Fourteen percent (14%) were grade 5, having pathological complete response, the majority (57%) had a triple negative hormone receptor status (Figure 1). The fact that chemotherapeutic agents cause some changes on some components of the tumour cells has been known since the 1960s. First, Waller demonstrated changes such as enlargement of the nucleus, swelling of the cytoplasm, vacuolization in the cytoplasm/nucleus in tumour cells following systemic administration of busulphan.6 Since changes in the molecular properties of cancer cells may affect the tumour behavior and therefore the treatment plan, studies investigating how the chemotherapeutic agents affect tumour grade, receptor properties of tumour cells and histopathological characteristics have recently been increasing in number. In this study we examined the quantitative changes in ER, PR and HER 2 and the histopathological response in breast cancer patients receiving NACT with doxorubicin, cyclophosphamide and paclitaxel. In our study, 80 patients (80%) were initially ER positive. Following NACT this dropped by 2%, which was statistically insignificant. The PR positivity changed from 66 (66%) to 62 which was statistically significant. In the present study baseline, HER2 positivity was found among 22 (22%) patients and the rest, i.e. 78 (78%) were revealed to be HER2 negative. However, after six cycles of NACT this figure became 28 (28%) and 72 (72%), respectively. Further analysis reflected that four out of 22 previously HER2 positive patients became negative after NACT whereas 10 out of 78 previously HER2 negative patients became positive after the therapy. It meant that 19 positive patients remained positive and 68 negative patients continued to have negative HER2 status in spite of getting NACT. This change in respect of the HER2 receptor expression was revealed to be statistically significant [p = 0.000 as per McNemar χ2test] (Table 1). In our study 14 (14%) of patients had pathological complete response following NACT. The majority (57%) of these had triple negative hormone receptor status. After treatment with NACT the pathological response grade of the breast cancer varies according to biomarker status, with triple negative breast cancers attaining the highest rate of a pathological complete response. The hormonal profile and HER2 receptor status may change to some extent. Proper pathological assessment and immunohistochemistry should be done before and after NACT to guide the surgeon in formulating appropriate treatment plans.